Pins for clothing and sewing, yes. But I hadn't realized that pins were also an essential tool for 18th c. writers. Thanks to (or cursed by, depending on your point of view) computers, most modern writers submit manuscripts electronically. Rewrites and copy edits are all conducted now through the magic of track changes and transmissions. Gone are the days of hauling manuscript boxes to the post office, not to mention pages that bristled with pink "flags", the comments and queries pasted to the edges of pages by editors. I've gotten to the point where the only words on paper I see in the entire process are in the finished book – and the way things are going, that may soon vanish, too. But what did writers do in the days before paper clips and Post-Its? How did an early novelist who was already struggling to make sense of a handwritten manuscript mark revisions and additions? According to the librarians of Oxford's Bodleian Library, the answer is pins – and lots of them. All those notes and insertions and extra copy were handwritten on scraps of paper and pinned in the margin with a straight pin. 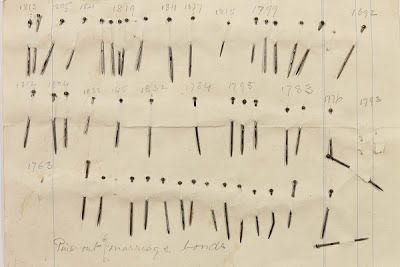 The pins, above, were all plucked from the library's holdings, and date from 1692 to 1853. In 2011, the Bodleian acquired a true Jane Austen rarity: the manuscript draft of her abandoned novel, The Watsons. (See here for more about the auction and the staggering realized price, as well as a page of the manuscript itself.) In addition to the clues to cross-outs and rewrites on the draft provide, there were also a wealth of pinned-on additions. 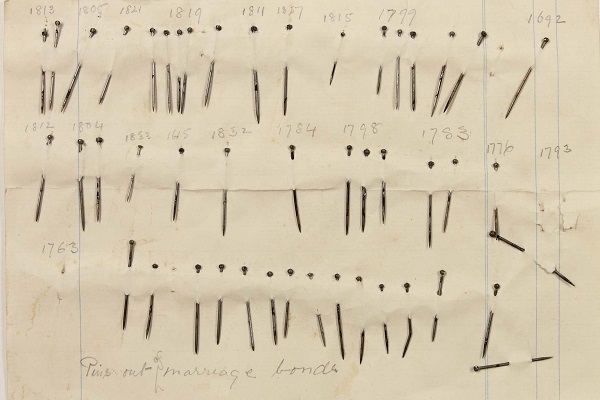 For purposes of preserving the manuscript, these pins were carefully removed with their notes, studied, catalogued, and saved – a librarian's scholarly labor of love. But as a fellow-writer, I like to imagine Jane at work at her small writing table. I wonder: did she use the same pins she used for her clothing, or did she have another stash of pins reserved for writing? Did she keep a pin cushion on the table with a stack of scrap-paper sheets beside her inkwell, prepared and ready to make changes? Or did she tuck them into her sleeve like a hurried seamstress might, keeping them literally at hand when she needed them? Here is the link to the original article about literary pinning by Christopher Fletcher, Keeper of Special Collections at the Bodleian Library. Thanks to Deb Barnum for first sharing this story with us. Above: Manuscript pins, c. 1690-1850. Bodleian Library. That is really fascinating! To tell the truth, I never thought about how they edited books back then! Imagine how awful it would be to lose the manuscript! We have just been learning editing and track changes in class, which has definitely confirmed to me that I am an author, not an editor. Editing a paragraph takes me about ten times as long as writing one! It's interesting to know the process though! And lucky that I live in this era, because my handwriting is terrible! Jane's lost Ms? What a fun idea for a novel. What an interesting post this is! When I first looked at the illustration, before reading the post, I thought that this was a collection of Jane's pins. To my mind, the pin patterns look like Morse or some other code. Perhaps there's a Dan Brown thriller "The Austen Code" in those pins and pinholes of The Watsons! My mother, who graduated from High School in 1949, saved her essays. They were pinned together with straight pins in order to be handed in together. I wonder when the paper clip/stapler came into household use? This is very interesting. But I wanted to let you know (excuse my English) about a BBC program, Pride and Prejudice: Having a ball , where many details of a 1813 ball were re-enacted. With the sweaty youngsters of a ballet-department, make-up and food of the time. Eudora Welty described using pins in an interview. I visited Eudora Welty's house in Jackson, MS when it first opened a few years ago. I remember being struck by a manuscript on her writing table that had all kinds of cuts and "pastes" held together by straight pins. It's been one of my take-away ah-has. Fascinating stuff here in your blog. You find the most enlightening items to pass on. I wonder how you have time to write! This is so cool! I've used them this way, but that's just because as a costumer a stray pin is often more readily at my fingertips than a paperclip, LOL! I've seen pins holding together 19 century/early 20th century papers the same way we use staples. It's not good to leave them up on the paper due to rust and corrosion but they do make interesting historical artifacts. I read your post and kept thinking of my bulletin board in my kitchen -- a conglomeration of papers and pins. Even if I bend a pin, I keep it...the sharp end still works. Thanks for your fun, enlightening posts. Your fun to follow! I work at the State Archives in Virginia, and up until the era of staples, many government documents are held together with either straight pins or something similiar--in one case, it was a diaper pin. Personally, Ive seen many documents from the Federal period here (Ohio and Michigan) held together with the same kind of gelatin wafer seals uses to enclose letters (these were often used instead of sealing wax--more portable?). 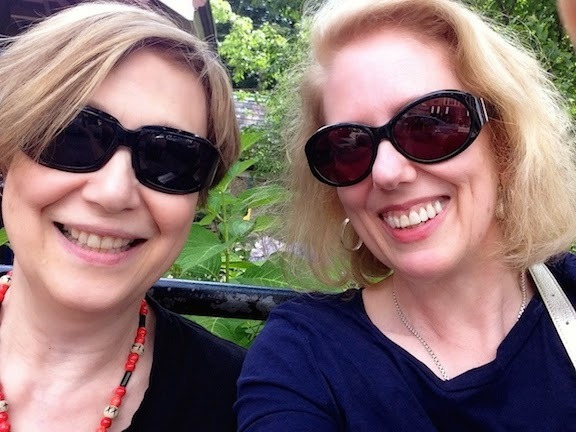 As the daughter of a linguist and of a historian specializing in the history of American political thought, who became a lawyer with an insatiable interest in historical "trivia" and a bad habit of editing everyone else, I compliment you. You have not only written of something interesting and little known, but you have also done so in a wonderfully literate manner. Thank you for having standards in a world with increasingly few. Thank you also for having a blog that could feed my insatiable curiosity at this hour of the night! These sorts of questions, unanswered, have been known to drive people mad;).